I look forward each winter to the release of Sierra Nevada Bigfoot Barleywine Ale. I saw a notice that it had arrived in Virginia a couple weeks ago, but it wasn't until this weekend that I was out shopping for beer that I ran across it. Actually, Colleen spotted it first, and a 4-pack was added to our cart. Needless to say I was excited to enjoy the ale and opened a bottle that same evening. I enjoy craft beer foremost for the flavor, but there's a visual aspect to the pleasure as well. A glass of Sierra Nevada Bigfoot Ale is a feast for the eyes. The translucent mahogany liquid is topped by a thick cap of beige foam. The head drops to a thin persistent layer leaving a lot of lacing behind. I could pick up on the aroma of sweet malt and some dark fruit as I was grabbing a blog photo. The flavor is strong with a start of bitter and piney hops followed by sweet, caramel malt and dark fruit notes. The 9.6% ABV does not overwhelm the flavor but the alcohol warmth is noticeable at the end. A bit of stickiness remains in the mouth with the lingering bitter finish. 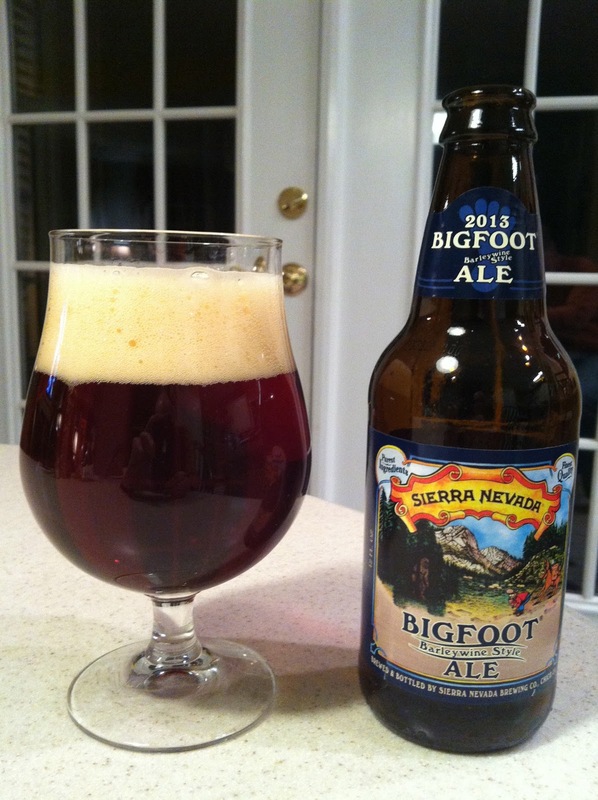 Sierra Nevada Bigfoot is a big beer, perfect for sipping on a cold winter night. Fans of Double/Imperial IPAs will appreciate the copious hops in this Barleywine. I've got bottles of prior year's releases set aside for aging, but to best appreciate the robust bitter hops, Bigfoot is a beer to enjoyed right away.